As the world grants an audience to Iranian President Mahmoud Ahmadinejad today at the U.N. General Assembly in New York, we would be better served to look upon Samiye Tohidlou. Samiye is a child of the Iranian revolution, born in 1979, when the current regime came to power. She comes from a family of educators; her father was a teacher who declared, after the arrest of his daughter, that he had been a staunch supporter of the revolution. Samiye was herself a doctoral student in sociology at Tehran University—the country’s oldest and most venerable institution—and an active member of the Islamic Student Association. And she was a volunteer for Mir Hussein Mousavi’s presidential campaign in 2009. 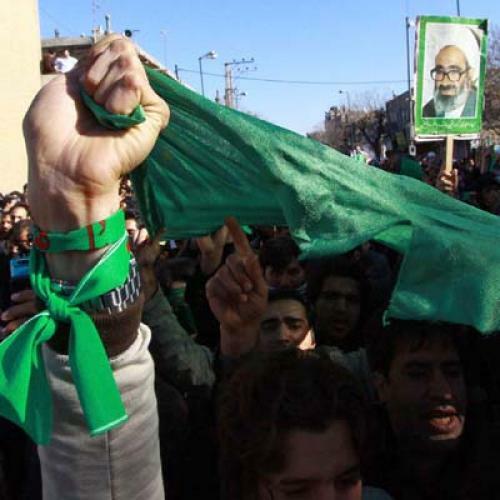 When the regime announced Ahmadinejad the winner even before the polls closed, in Tehran alone three million people took to the streets to protest what they considered to be an electoral putsch. Samiye had a brilliant and elegantly simple idea. She suggested that protesters create an uninterrupted chain of humanity, from Tehran’s rich, northern neighborhoods to the south’s poorest ghettoes. The only connective thread of this long chain was a green ribbon, symbolizing the movement that had emerged in opposition to the electoral coup. The night of the election, Mousavi’s campaign headquarters were seized by security forces. At three in the morning of the next day, a group of eight men converged on the small house Samiye shared with her husband. After ransacking the house and confiscating her phone and laptop, the men took Samiye away. They kept her in the infamous Evin prison for 70 days, subjecting her to all manner of physical and mental abuse. She was eventually released with a bail of $200,000—a teacher’s salary in Tehran is no more than a few hundred dollars. Her sentence also called for 50 lashes of the whip. Even after the prison ordeal, and with the rest of the sentence hanging over her, Samiye remained defiant. She continued to maintain a blog, cautiously critical of the regime. Her prose is elegant and simple, yet also filled with carefully culled references to literature and religious texts. Finally, last week, she had to submit her frail body to Evin authorities to be flogged. Even amongst the interrogators and torturers gathered there, no woman was willing to undertake the abominable task of flogging this young, valiant lady. The same man who had presided over her “trial” was now forced to implement his own shameful and medieval order. For a regime that is increasingly keen on enforcing gender apartheid, separating men and women, it is the quintessence of hypocrisy to allow gender-mixing when it comes to torturing, arresting, or flogging its opponents. Samiye was lashed 50 times. Even after her mind-numbingly scandalous punishment, she remained defiant. On her blog, she wrote, addressing her torturer, and more importantly the regime he represents: “Be happy. Your intention was my humiliation. I confess my whole body and soul experienced this humiliation. So much so that I can’t believe I can ever sustain it again. … You have humiliated me today. My pride was broken.” But then she reminds her torturer that individual dignity and pride are not in his dishonorable hands. “I will have died of grief,” she writes, “if I thought you were the measure of my dignity.” She ends by simply saying, “This is not the end.” And she is right: Her defiance and dedication, her profound humanity and dignity, stand in sharp contrast to the desperate despotism of the regime and its medieval forms of punishment. In Samiye’s grief, humiliation, and daring defiance one can read the proud democratic future of the nation.